And so it begins. 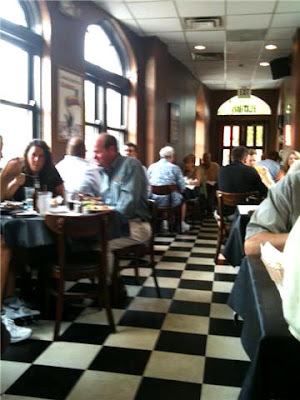 (614) Magazine Restaurant Week starts today and runs through Saturday, July 17th. The list of participating restaurants is quite impressive. This makes it incredibly difficult to narrow down the choice of where to go. I’ve gone over the list of menus again and again. And I mean over, and over, and over, again and again, and again. There are so many that I want to try. Oh the decisions. The first one that I just could not get out of my mind was the Flatiron Bar and Diner. I kept coming back to it and drooling. So when Bob got home tonight and we were deciding where to go, that was what I was pushing for. Let me tell you, it sure didn’t take much pushing to get him to agree! Off we went. 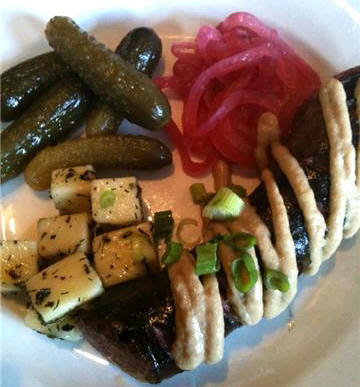 The Flatiron doesn’t take reservations; it’s first come, first serve. It’s such a fun place to eat. The building is actually pie shaped. It was built in 1914, and the narrow part of the building was originally a saloon. From the end of the bar to the back door (the widest part of the building) was a grocery store. We love the building, especially the windows! This is such a gem in downtown Columbus. The food is absolutely delicious! 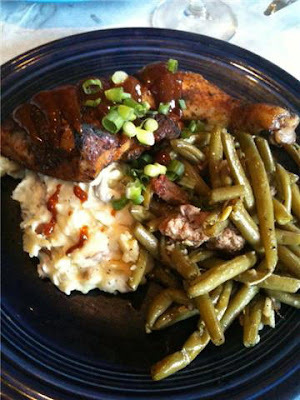 Their website describes the food as “bold tastes of Cajun, Creole, barbecue, and low country cuisine”. I just say it’s good. Let me get on with business and show you. The first course was a choice of salads. 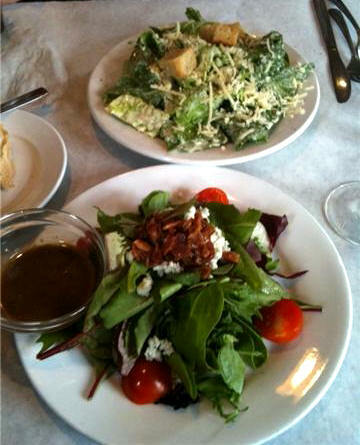 I got the Mixed Green Salad with candied jowl bacon and bleu cheese, and Bob got the Traditional Caesar Salad. My salad was wonderful. The candied jowl bacon took this salad to a new level. The balsamic dressing was spot on; with flavors that were perfectly balanced. Bob said his Caesar salad was quite good. 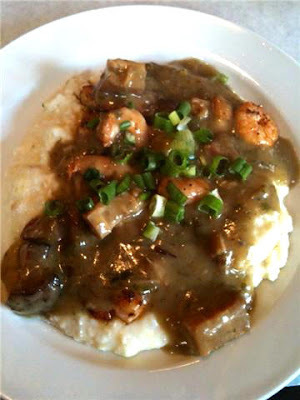 My choice was the Laughing Bird Shrimp and Stone Ground Grits with Ohio pork belly red eye gravy. Holy cow was this good! The grits were delicious alone, however paired with the shrimp and pork red eye gravy, this dish was absolutely wonderful. I’d have been happy if this had been my main dish! Bob’s choice was even better! (Good thing we were sharing, or things might have gotten a little dicey here!) He got the Homemade Smoked Texas Sausage Plate with apple stadium mustard, cornichons, red onions and herb marinated provolone cheese. Wow! The smokiness of the sausage was unbelievable. The squiggle of mustard running along the top of it was classic. And the cornichons were the perfect accompaniment! A bite of the sausage got the flavors of the meat and the smoke working in my mouth. Then I took a bite of the cornichons and it about brought me to my knees. What a plate! The third course did not disappoint. 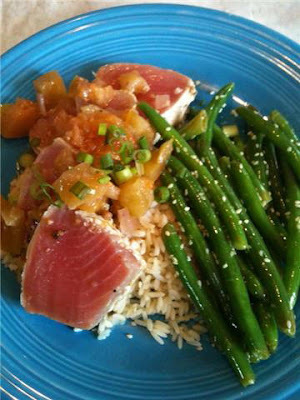 Bob ordered the Seared Yellowfin Tuna Medallions with green tomato chutney and benne beans. Bob said the tuna was delicious. The chutney was really interesting … a good interesting. There was the tartness of the tomatoes, but also tanginess from vinegar and sugar. The tuna was served on a bed of white rice with a side of string beans that had been blanched and dressed with an oh-so-light dressing and sprinkled with sesame seeds. They were crisp and fresh and nutty. My third course was heaven. Truly I mean it! I had Smoked Chicken Leg Quarter with chipotle orange BBQ sauce, Boursin mashed potatoes and southern style green beans. I swooned. I nearly fell out of my chair! Talk about comfort food. Oh my. Let me begin with the green beans. Bob’s were bright green. Mine were dark, army green. I like my beans cooked within an inch of their lives. So sue me. These were like my mom made them. They were soft and had chunks of pork. I could have wept. The beans were nestled up against mashed potatoes. Not smooth, over-whipped, squirted out of a pastry bag potatoes (although I’d never turn my nose up at those … me + potatoes = happy girl). These potatoes had Boursin cheese in them and had lumps and steam coming off of them. And plopped on top of all this happiness was a chicken leg quarter with skin that was charred and smeared with Flatiron’s chipotle orange BBQ sauce. Love on a plate is what it was. Nothing should taste this good. It just ruins me for mediocre food (hmm … like my own cooking, maybe?). What a dinner! And all of this for $20 each! Is that crazy or what??? Special thanks to an awesome and incredibly hardworking server, Amber. You were terrific! If Flatiron Bar and Diner isn’t one of your choices this week, it should be!